Puzzle Competitions are oceanwide automated events set up by Ocean Masters. They are accessible from any tournament board, as shown in the image on the right. Once you have joined the Puzzle Competition, you will get a notice in your Ahoy! tab showing that you are a competitor and listing the prizes that can be won for each category. The notice will also count down the time until the start of the competition. Closing this notice will not resign you from the competition. You can view the competition status at any time by clicking the "Details" button for that competition in the Ahoy panel or on the Tournament board, which can be found in any Inn. Puzzle Competitions can be for single puzzles or for multiple puzzles. They can be for any shipboard and crafting puzzle, or any combination thereof. There are two types of Puzzle Competitions: Ranked Competitions and Performance Level Competitions. 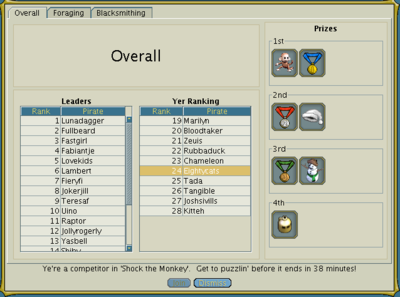 Ranked Competitions award prizes for to the top placing pirate for each puzzle and overall. 1st, 2nd, 3rd, and 4th places winners are possible. The details panel for Ranked Competitions lists the current leaders on the left, your ranking in the panel to the right, and on the far right, the prizes for the competition. Performance Level Competitions award prizes for the best performance at each ratings level. Prizes for the best Fine, Good, Excellent, and Incredible entries are possible. You can see the status of a competition by pressing the "Details" button on the competition's Ahoy panel or Tournament listing. You can see the results for each puzzle and overall by clicking the tabs at the top of the panel. The prizes and top pirates are listed for each performance level. Your best performance level (if you are participating) is shown on the top right. To see your current rank, take a look at the Rankings for your performance level. For example, if your best performance is "Good", look at the list of "Good" pirates. You may need to scroll down a bit. Your ranking and the ranking of your closest competitors can be found there. Your name will be highlighted. Rankings for performance levels less than Fine are not shown. Your best score in each performance level will be ranked. So if you have a high "Good" score, your low "Excellent" scores will not keep you from possibly winning the Good prize. This means that it also is possible for a pirate to win prizes in more than one performance category. Your overall performance ranking is an average of your best performance in each of the competition's puzzles. If you want to do well overall, be sure to participate in all of the puzzles. 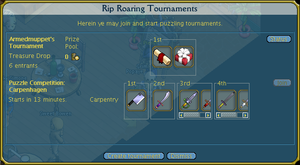 Overall performance prizes may not be offered for every competition (for example, a competition with only one puzzle will not have overall prizes). 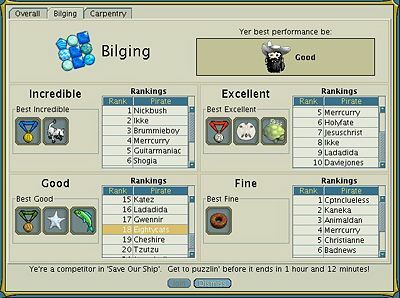 Each time you puzzle for a league in a ship based puzzle or complete a crafting session in a crafting puzzle, it is counted as an entry for the competition. Each league or session is counted separately, as prizes are awarded for the best puzzling session, not collective puzzling done during the time the competition runs. You may 'enter' the competition as many or as few times as you wish by puzzling for one league or puzzling the entire time for the duration of the competition. Be careful to start your duty or crafting after the competition has started. Scores for puzzles that are started before the competition as well as puzzle sessions shorter than one minute will not count. When the competition starts, you are not whisked to a puzzling location. You must find a place to puzzle. For ship-based puzzles, this includes navy vessels, a vessel that you own, or jobbing with another crew. For crafting puzzles, any shoppe or stall will suffice. Once the Puzzle Competition ends, system messages announcing the winners of the competition will appear. The winners' names are also displayed above the prizes that they have won on the competition details panel. This page was last modified on 7 August 2014, at 06:22.